Medical Carts are often the best solution for supporting clinicians’ highly mobile workflows, allowing patients to be treated wherever they may reside in healthcare facilities. However, that very mobility also introduces significant risks to equipment and user alike that must be carefully considered and dealt with in order for medical cart-based equipment to be used with effectiveness, efficiency, and satisfaction. Our user-centered design process ensures the right mobile solution is specified and developed while sufficing regulatory concerns, delighting users, and mitigating risks. There’s no fiscal sense in reinventing the wheel if off-the-shelf (OTS) solutions are readily available, so the first step in developing a medical cart solution is to work with our client to determine the level of customization required to meet usability, product, and business goals. If little to no customization is needed, we will suggest that our customer work directly with an OTS cart supplier. Timelines are shorter, and the cost is comparatively low given that no non-recurring engineering (NRE) investment is required. One key risk: OTS solutions often meet some usability goals, but not all. The lack of compliance in key usability metrics runs the risk of promoting a dissatisfying user experience and, in some cases, could introduce unforeseen use errors. If an initial audit of your usability goals renders an OTS solution unfeasible or risky, you’re left with semi- or fully-customized medical cart solutions. 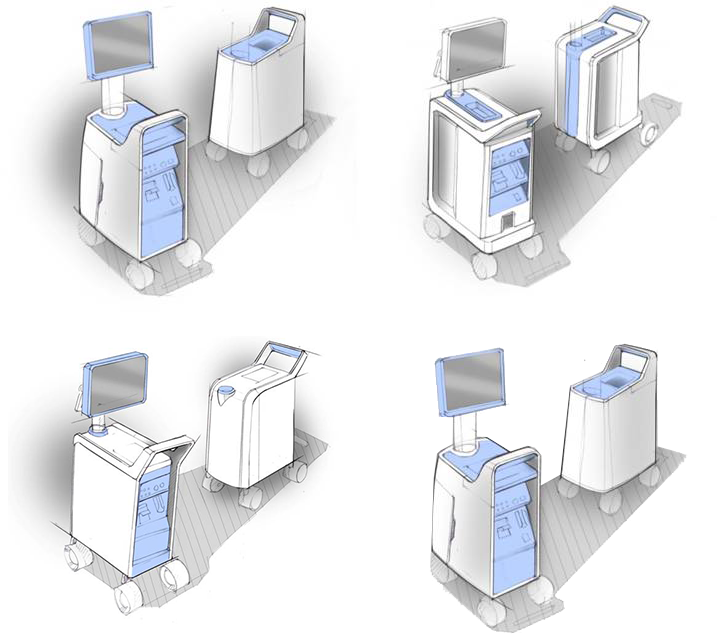 Semi- or fully-customized carts can be developed in close collaboration with manufacturing resources that focus on medical carts or other aspects of a system’s technology. This route, in our experience, allows for almost limitless customization to align with client usability goals, branding requirements, cost of goods targets, performance objectives, etc. While the ability to design a custom medical cart from scratch may be only limited by budget expectations, what you think you need in a medical cart design is moot if you don’t first focus on providing a usable, intuitive, safe, and effective design. 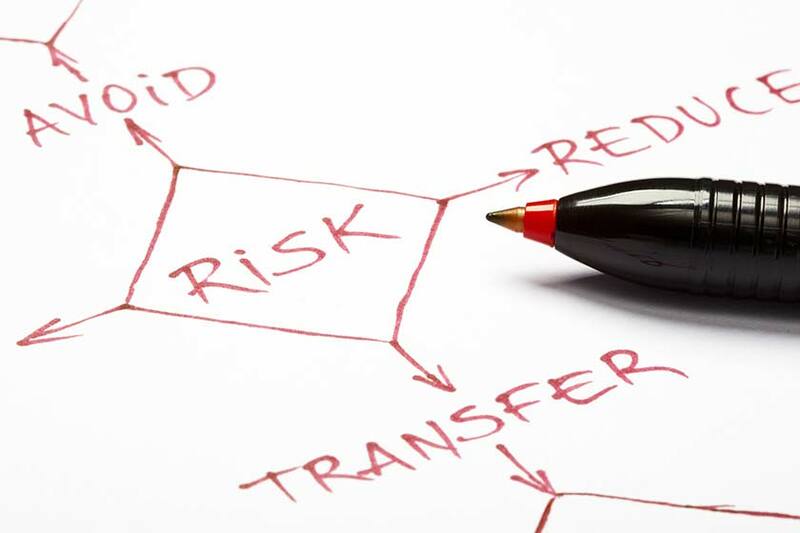 The key to mitigating risk with users is to carefully analyze and determine who your end users are, what are the environments that your medical cart will be transported through and operated in, and how your end users will interface with your system. Typically, our customer has a good handle on who uses their products. Once this cohort is confirmed, critical task identification and categorization early in the medical cart development process—followed by risk analysis and identification of known use-related problems—sets the stage for designing a system that will be usable and safe to operate by the broadest range of users in the most diverse potential use environments. Clinicians who use medical carts frequently complain about issues relating to cart transportation, shared space, and accessibility. When a medical cart gets pushed or pulled through a healthcare facility, the placement of handholds must fit the broadest array of potential users to remain comfortable to use and allow for safe transportation handling. Hand placements that require taller users to slouch or shorter users to stretch uncomfortably will quickly grow tiresome and painful to use and may result in repetitive use injuries or promote unsafe use. When a medical cart is stationary, it is often adjacent to other equipment within an environment full of quick-moving clinicians. Larger caster wheels and wider bases may solve stability problems, but when mobile these solutions often pose a hazard to user or passerby feet, and when stationary may present a dangerous tripping hazard. Finally, accessing medical instrument controls on a cart-based product similarly requires that the user interface be intuitive and easy to use by the broadest possible selection of potential users. While physical elements like buttons and scroll wheels alongside a touch screen graphical user interface seem to receive the most attention, a surprisingly large number of clinician complaints stem from poor cable management of power cords and various instruments that will be used with the main unit. Mocking up all elements of a medical cart early and often—and letting a diverse selection of potential users interact with prototype systems to stress the highest risk tasks as frequently as is feasible—helps to ensure that use error risks are mitigated and no details are left to chance when it comes to designing a product that can be used with effectiveness, efficiency, and satisfaction. 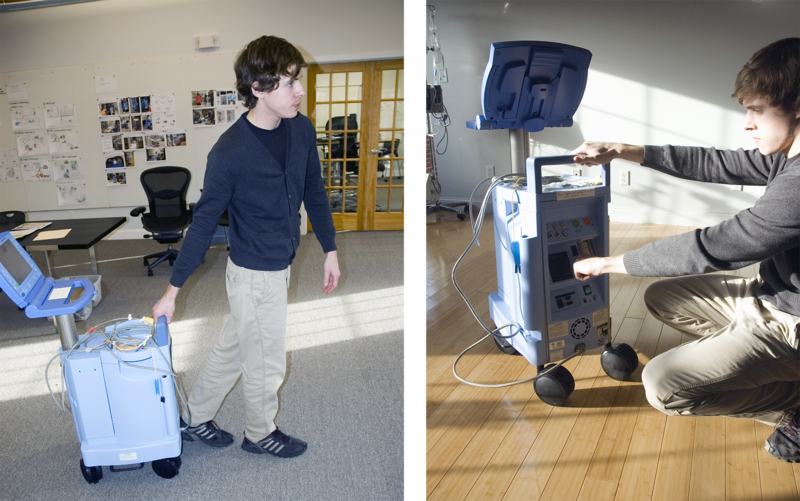 Eclipse Product Development's approach to designing an intuitive and useful medical cart.